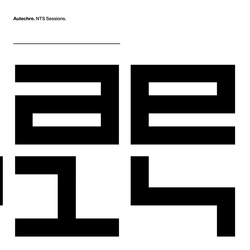 Autechre - Autechre - NTS Sessions (LP Box Set) . NTS SHOP. NTS Sessions was originally aired as part of a month-long residency at NTS Radio and features eight hours of new music from Autechre. 12xLP in printed inner sleeves with foil block to each cover. Housed in a two part rigid slipcase wrapped in printed offset stock with foil block to cover. Included 24-bit .wav audio download.